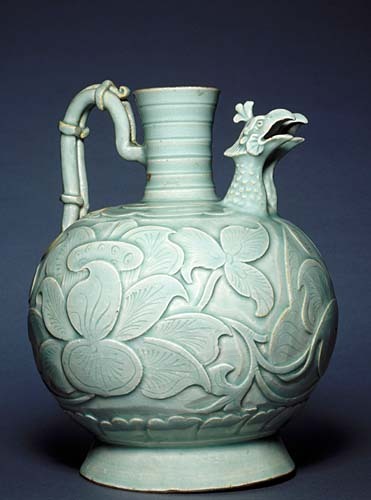 It was perhaps because of their contrasting colors and painstaking execution that the phenix celadons earned their place as items of imperial tableware. Indeed, this particular piece, with its twin phoenix-head spouts, was presumably intended for the palace of the Empresses, of whom the phoenix was the symbol. Both the decoration and form used reveal stylistic similarities with gold and silver tableware, the decorative models of which, inherited from the Tang (618-907), were related to metalworking arts in the Near East. Nevertheless, they belong to an evolutionary process that was to liberate ceramic decoration from metalworking influences and to provide it with its own repertoire of forms and motifs. This type of glaze also played a key role under the early Song. Carrying on from the Miseyao, it paved the way in elevating ceramics in the eyes of the social elite, first to the rank of tableware, and subsequently to the status of collection objects on a par with silver, gold, and lacquerware.